1. 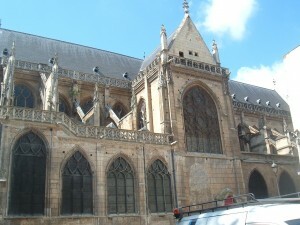 Cloister of Saint-Merry, intersection of the rue Saint-Martin and the rue du Cloître Saint-Merri. This is the site of the real barricade that Hugo based his fictional barricade on. 2. 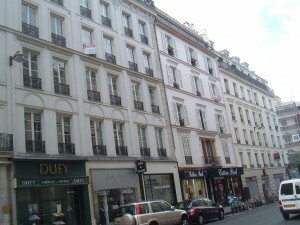 Rue de l’Homme-Armé, where Valjean had his apartment. There’s a plaque on no. 40 indicating the former name of the street, though this wasn’t where Valjean’s apartment would have been. Number 7, rue de l’Homme-Armé, would have been across the street, probably on one of the corners of the rue du Plâtre. 3. No. 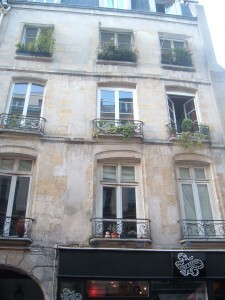 16, rue de la Verrerie, where Marius lodged with Courfeyrac after moving out of the Gorbeau house. Go down the rue de la Verrerie and turn right, then immediately left onto the rue de Rivoli. Eight or nine blocks down the rue de Rivoli is a church we’ll come back to in a moment. Turn left onto the street facing the church. 4. No. 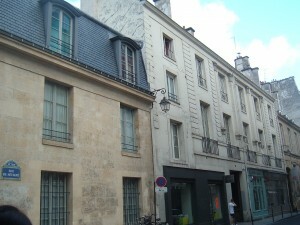 11, rue de Sévigné is where Gavroche helped Thénardier escaped from the prison of La Force. If you don’t mind backtracking a couple blocks, there’s a fragment of the actual wall of La Force at 24, rue Pavée. 5. 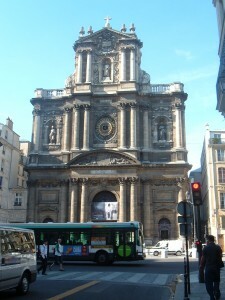 The Église St-Paul-St-Louis, back at the base of the rue Sévigné, is where Marius married Cosette in 1833–and also, not by coincidence, where Victor Hugo’s own daughter Léopoldine was married in 1843. Here, the rue de Rivoli becomes the rue Saint-Antoine. Follow it, then make a left turn into the rue de Birague, which takes you to the Place des Vosges. 6. The Victor Hugo Museum is located at no. 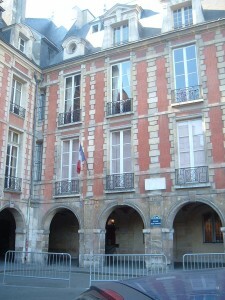 6, Place des Vosges, in one of Hugo’s old apartments. Admission is free, so go in and take a look around. 7. 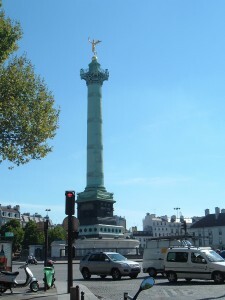 The Place de la Bastille. Quite aside from any trifling details like revolutions, fortresses, and angry mobs, the Place de la Bastille was also the site of Napoleon’s elephant, where Gavroche sheltered his two younger brothers for the night. The elephant is gone, and has been replaced by the July Column. At this point, you can either consider the walk over, or go to check out M. Gillenormand’s apartment at no. 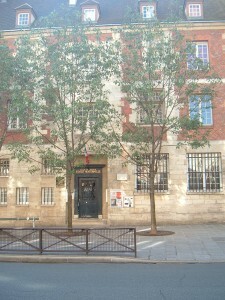 6, rue des Filles-du-Calvaire. If your feet are tired and you’d like to take the Métro, the Filles-du-Calvaire station is three stops away from Bastille on line 8 towards Balard. If you’d prefer a walk of about ten or twelve blocks, take the boulevard Beaumarchais, which turns into the boulevard des Filles-du-Calvaire, which leads to the Place Pasdeloup. When you get there, turn left into the rue des Filles-du-Calvaire. No. 6, on the left, was M. Gillenormand’s residence.